DP-Allopurinol (Allopurinol) is prescribed by doctors to treat a variety of conditions, including kidney stones, gout and excess uric acid levels in the body. High levels of uric acid can sometimes occur as a result of treatment with anti-cancer medication. Kidney stones and gout attacks are also caused by uric acid. 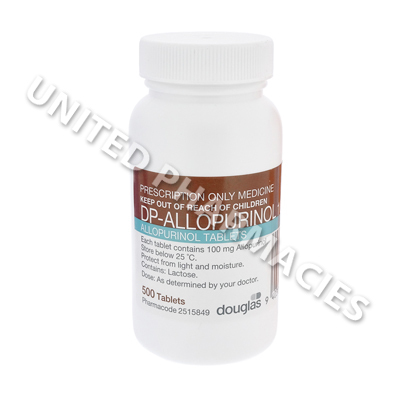 DP-Allopurinol (Allopurinol) is prescribed by doctors to treat a variety of conditions, including kidney stones, gout and excess uric acid levels in the body. High levels of uric acid can sometimes occur as a result of treatment with anti-cancer medication. Kidney stones and gout attacks are also caused by uric acid. This medication is a type of xanthine oxidase inhibitor, and it helps to lessen the body`s production of uric acid. Patients should note that this drug is used to prevent the occurrence of a gout attack, and not to treat one that has already occurred. DP-Allopurinol (Allopurinol) comes as tablets, which must be taken in accordance with the prescribing doctor`s instructions. Adult patients are usually directed to take it 1 to 2 times per day. Doctors recommend taking the medicine after a meal. This medication can take several months or longer to fully work, and there is a slight possibility of it increasing the amount of gout attacks when treatment is first started. However, eventually it will help to prevent these attacks. If your doctor has prescribed this medicine for you, it is necessary to continue taking it unless told otherwise. Remember to tell your doctor about any side effects that occur. This is especially important if they persist or become more serious. In rare cases, this drug may cause severe side effects. You need to immediately consult your doctor if you notice appetite loss, sudden weight loss, itchiness, bloody urine, eye irritation or any other reactions. Prior to the commencement of treatment with this medication, it is necessary to inform your doctor about past or present medical problems, such as liver disease, kidney problems, high blood pressure, strange diets or diabetes. Patients are advised to consult their doctor and discuss the safe consumption of alcohol before taking these tablets, as alcohol may reduce the effectiveness of this drug. Always use Allopurinol-Apotex (Allopurinol) as you have been prescribed by your doctor. Never self-medicate or change your dosage without first consulting your doctor. The correct dosage can vary depending on your health, medical history, and the severity of the condition being treated.